Toyohara Chikanobu (1838 - 1912) Jidai kagami - A Mirror of the Ages. 1897. Oban. The third print from this series in the show is a fine, incisive design of a woman with a ribbon in her hair and a single comb and hair pin. 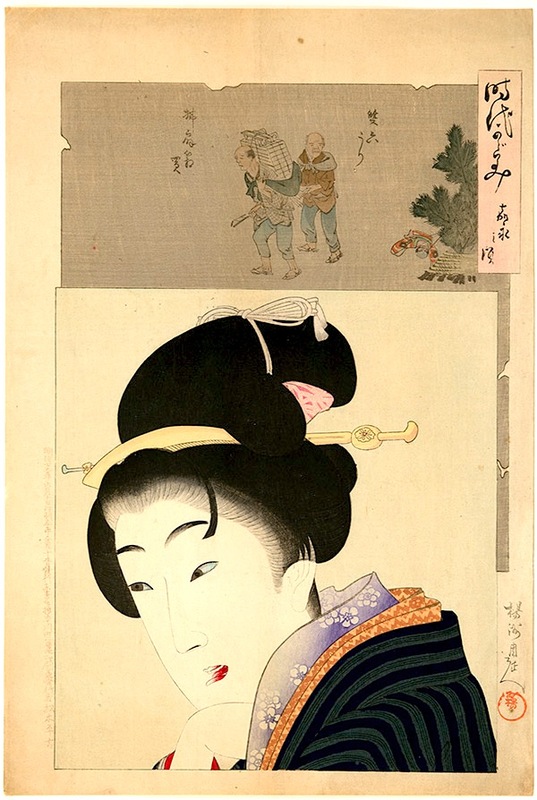 Chikanobu is one of the giants of the Meiji era of Japanese woodblock prints. With Kunichika and Yoshitoshi, Chikanobu distinguished the turmoil of Japanese culture as it came to terms with the new age. Like them his life and career were inextricably linked to the upheavals in Japanese history and the near civil wars that characterised the time. This whole series is one of the outstanding achievements of late nineteenth century Japanese art. One of his best series, A Mirror of the Ages showed women by fashion and hair style throughout history. There is of course the longing for the past and yet these prints are unmistakably modern and of their time. The subject in each print is the finely rendered foreground figure shown as a portrait head and the upper quarter a scene in grisaille from the chosen period. The quality of printing is outstanding, especially in Chikanobu’s use of white for the rendering of the powdered faces. It is often forgotten by art historians that this was the period above all others when the technique of woodblock printing achieved its zenith whilst at the same time there were artists of stature to execute it. The print is full size with wide margins. Very fine impression and colour, strong wood grain in the scenic view and exceptional fine line work. Very good overall. Signed Yoshu Chikanobu. Published by Matsuki Heikichi.